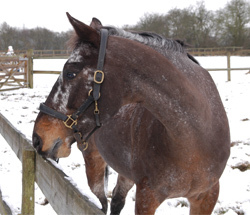 Buddy is an Appaloosa/draft cross, and as such has very distinctive markings - I've shown him in his winter coat, which is quite appropriate for his snowflake colouration. "I was amazed at how Andrew managed to capture the essence of Buddy in this portrait. This couldn't have been achieved without the time he spent with Buddy on a cold January morning in the snow, or without his superb attention to detail. 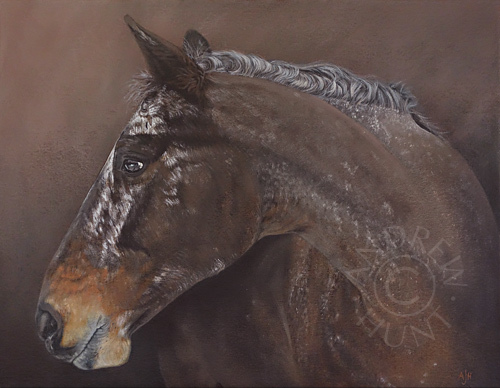 This portrait will mean that a much loved old horse will always be a visible part of the family. Many thanks Andrew." I love the strong individuality of Appaloosa markings - he really does look like he's been splattered with paint. Buddy was quite a character too, and quite a challenge to take photos of, as he was NOT going let me in his field to get close-ups - note the fencing in the photo below!